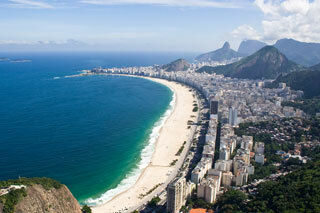 Copacabana beach is one of the most famous in the world extending for 4km and always alive. The are live performances during the day and a lot of water activilities are available. This article uses material from the Wikipedia article "Copacabana Beach", which is released under the Creative Commons Attribution-Share-Alike 3.0 License.